The Braque Français is one of several French braques, or pointers. 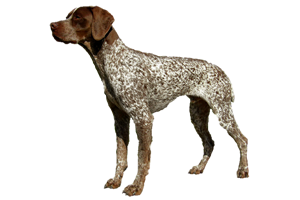 This breed in particular is an all-around gundog, not just a pointer. It is capable of pointing, trailing game, flushing and retrieving. There are two sizes to this breed, the Gascony (Grande Taille) is the larger and the Pyrenees (Petite Taille) the smaller. It is believed that the Braque Français is one of the oldest French breeds, developing in southern France. Their ancestors may have resulted from crosses involving the Old Spanish Pointer and the Southern Hound (both of which are now extinct) or the Bracco Italiano. It was used in the development for most of the other French gundogs, to the point that it almost became extinct at the end of the 20th century and remains rare today. Is the Braque Français Right for You?